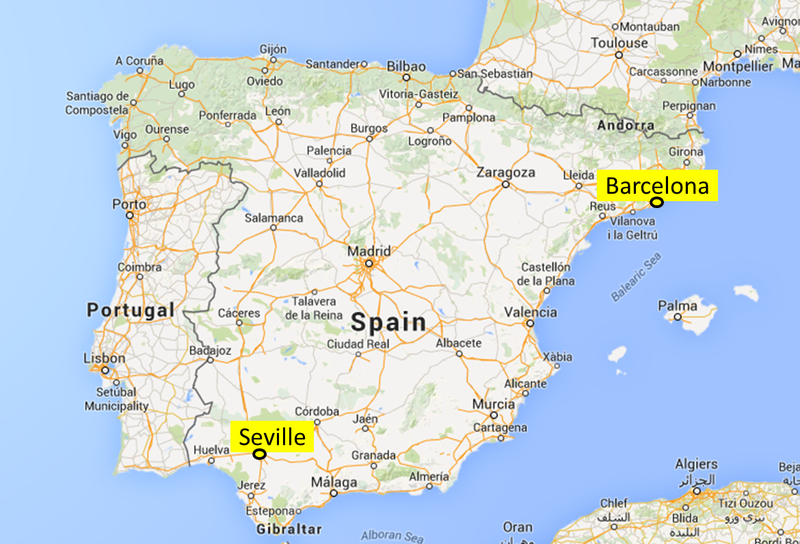 The two cities I have in mind are both Spanish: Barcelona in the north of the country, and Seville in the south. They’re each outstanding cities. I’ll come back to these two cities in a moment. But first, a word about two speeds – two speeds of futurism – slow-paced futurism and fast-paced futurism. As someone who’s had the word “Futurist” on my personal business card since early 2009, I’m inspired to see more and more people taking the subject of futurism seriously. There’s a widespread awareness, nowadays, that it’s important to analyse future scenarios. If we spend time thinking about the likely developments of current trends, we’ll be better prepared to try to respond to these trends. Instead of being shocked when disruptive forces burst through from being “under the radar” to having major impacts on lifestyles and society, we’ll have been acting to influence the outcome – pushing hard to increase the likelihood of positive changes, and to decrease the likelihood of negative changes. But it’s my observation that, in many of the meetings I attend and the discussions I observe, the futurism on display is timid and conservative. Well-meaning speakers contemplate a future, ten or twenty years ahead, that is 95% the same as today, but with, say, 5% changes. In these modestly innovative future scenarios, we might have computers that are faster than today’s, screens that are more ubiquitous than today’s, and some jobs will have been displaced by robots and automation. But human nature will be the same in the future as in the past, and the kinds of thing people spend their time doing will be more-or-less the same as they have been doing for the last ten or twenty years too (except, perhaps, faster). Cryonic suspension of people on the point of death will have become pervasive, since the credibility of the possibility of reanimation by future science will have grown much higher. So whilst I cautiously welcome the slow-paced futurists, I wish more people would realise the immensity of the transformations ahead, and become fast-paced futurists. One group of people who do have a strong appreciation of the scale of potential future changes are the faculty of Singularity University. In November, I took part in the Singularity University Summit Europe held at the DeLaMar Theater in Amsterdam. The speakers clearly knew their material, and were comfortable providing good answers to the various questions raised by audience members (including offbeat and tangential questions). People in the audience told me later that their jaws had been on the floor for nearly the entire two days. My own reaction was: I should find ways of enabling lots more people to attend future similar Summits. The experience would likely transform them from being slow-paced futurists to fast-paced futurists. Happily, many Singularity University faculty members are returning to Europe, for the next Summit in the series. This will be taking place from 12-14 March in Seville. You can find the details here. And did I mention that the event is taking place in the fabulous history-laden city of Seville? Never having attended 3GSM before, I had a rapid learning curve. Symbian’s PR advisors gave me some impromptu “media training”, to lessen the chance of me fluffing my lines, unwittingly breaching confidentiality restrictions, or otherwise saying something I would subsequently regret. My diary was soon full of appointments to talk to journalists from all over Europe, in the cramped meeting rooms and coffee bars in Cannes. The evenings were bristling with networking events in the yachts which clustered around the dock areas. Happily, when the week was over, there was nothing to regret. Indeed, Symbian’s various PR departments invited me back for numerous interviews at every subsequent 3GSM. In later years, 3GSM changed its name to MWC (Mobile World Congress), and outgrew Cannes, so it relocated instead to Barcelona. I have attended every year since that first sudden immersion in 2002. But all good things come to an end (so it is said). In recent years, I’ve found MWC to be less compelling. Smartphones, once dramatically different from one year to the next, have slowed down their curve of change. The wellspring of innovation is moving to other industries. After MWC 2014, I had the privilege to chair a discussion of industry experts in Cambridge, co-hosted by Cambridge Wireless and Accenture, regarding both the highs and lows (the “fiesta” and the “siesta”) of the Barcelona event. In that panel, the expressions of “siesta” (snooze) were consistently more heartfelt than those of “fiesta” (feast). When the time came, a few weeks back, for me to decide whether to follow my habit of the last dozen years and book my presence in Barcelona for 2015, I found my heart was no longer inspired by that prospect. I’ve decided not to go. I’m sure a great deal of important business will happen during these hectic few days at MWC, including some ground-breaking developments in fields such as wearable computing and augmented reality. But that will be slow ground-breaking – whereas it’s my judgement that the world needs, and is headed towards, fast ground-breaking. And Seville, ten days later, is the place to get early warning of these changes. So that’s where I’m headed. Luis Rey: Director of the Singularity University Summit Spain. The preview will start at 9am with tea/coffee and light breakfast. Presentations will start at 9.10am. To register to attend the free preview, see here (EventBrite). Wireless has spent two decades disrupting numerous other industries. But the boot is now on the other foot. This talk anticipates the powerful forthcoming trends that threaten to steamroller the wireless industry, with the well-spring of innovation moving beyond its grasp. These trends include technologies, such as artificial intelligence, next generation robotics, implantable computing, and cyber-security; they also include dramatic social transformations. The talk ends by suggesting some steps to enable a judo-like response to these threats. How can mobile reach its potential to improve both the outcomes and the economics of global health? That’s the headline question for the panel I’m chairing on Wednesday at the Mobile World Congress (MWC) event in Barcelona. CEOs from more than 3,500 companies. This year, a larger venue is being used, and the attendee numbers are expected to be even larger. Keynote speakers include the CEOs or Presidents from Vodafone, Telefonica, China Mobile, AT&T, Telecom Italia, NTT DoCoMo, Korea Telecom, Deutsch Telekom, Qualcomm, Nokia, General Motors, CNN Digital, American Heart Foundation, Bharti Enterprises, Qtel, Ericsson, Viber Media, Juniper Networks, Dropbox, Foursquare, Deezer, Mozilla, Ubuntu, Tizen, Jolla, and countless more. And in the midst of all that, there’s a panel entitled Health: Achieving Scale through Partnerships – which, in my role as Technology Planning Lead for Accenture Mobility, I’ve been asked to chair. MWC as a whole generates a lot of excitement about mobile technology – and about relative shifts in the competitive positions of key companies in the industry. However, it strikes me that the subject under discussion in my panel is more profound. Simply put, what we’re discussing is a matter of life and death. Done well, mobile technology has the potential to enable the delivery of timely healthcare to people who would otherwise be at risk of death. Prompt diagnosis and prompt treatment can spell the difference between a bitterly unpleasant experience and something that is much more manageable. When people use healthcare services, they often incur high, sometimes catastrophic costs in paying for their care. In some countries, up to 11% of the population suffers this type of severe financial hardship each year, and up to 5% is forced into poverty. Globally, about 150 million people suffer financial catastrophe annually while 100 million are pushed below the poverty line. It’s not just individuals who are facing ruinous costs from healthcare. A 2011 study by the World Economic Forum and Harvard University anticipates that productivity losses and medical treatment for diabetes, heart disease and other non-contagious chronic diseases will cost economies $47 trillion by 2030. In the UK, the growing cost of treating diabetes alone is said to be likely to “bankrupt the NHS in 20 years”. In countries around the world, surging costs of healthcare treatment are exceeding the growth rates of the national economies. By enabling earlier detection of medical issues: prevention can be much cheaper than cure! By reducing barriers for people to access information relevant to their health and well-being. Here, the key phrase is “in principle”. The potential of mobile technology to beneficially transform healthcare has long been recognised. Success stories can indeed be found. This recent NBC news video featuring physician Eric Topol contains some excellent examples of the use of smartphones in medical practice; for my review of Dr Topol’s award-winning book “The Creative Destruction of Medicine” see my previous blogpost Smartphone technology, super-convergence, and the great inflection of medicine. Nevertheless, the mobile industry is full of people who remain unsure about how quickly this potential can turn into a reality. Specifically, people wonder how their programmes will ever deliver meaningful commercial revenues to their companies – since, after all, these companies are driven by commercial imperatives. In this sense, the question of scaling up mobile health programmes is a matter of commercial life-or-death for many managers within the mobile industry. Without credible plans for commercially significant revenues, these programmes may be cut back, and managers risk losing their jobs. There are hundreds of live and pilot mHealth deployments currently underway across many and diverse territories, but many of these projects, both commercial and pilot, will remain short term or small scale and will fold once initial funding is exhausted. To reach scale, mHealth systems must in many cases be designed to integrate with existing health systems. This is not something the mobile industry can achieve alone, despite operators’ expertise and experience in delivering end-to-end services to their customers, and will require strong working partnerships between mobile network operators, health applications and health IT providers. Speakers in this session will draw upon their own experience to showcase examples of mHealth projects that have gone beyond the small scale and pilot stages. They will seek to identify best practice in making mHealth sustainable, and will discuss the progress and challenges in partnering for mHealth. Pamela Goldberg is CEO of the Massachusetts Technology Collaborative (MassTech), an economic development engine charged with charged with catalyzing technology innovation throughout the Massachusetts Commonwealth. She has an extensive background in entrepreneurship, innovation and finance, and is the first woman to lead the agency in its nearly 30 year history. MassTech is currently advancing technology‐based solutions that improve the health care system, expand high‐speed Internet access, and strengthen the growth and development of the state’s technology sector. Kirsten Gagnaire is the Global Partnership Director for the Mobile Alliance for Maternal Action (MAMA), where she manages a cross-sector partnership between USAID, Johnson & Johnson, the UN Foundation, the mHealth Alliance and BabyCenter. MAMA is focused on engaging an innovative global community to deliver vital health information to new and expectant mothers through mobile phones. She recently co-lead the Ashoka Global Accelerator, focused on getting mid-stage social entrepreneurs in developing countries the support & resources they need to scale their work across multiple countries and continents. These organizations are focused on using innovation and technology to address global health issues. She recently spent a year living in Ghana, where she was the Country Director for the Grameen Foundation and managed a large-scale mobile health project focused on maternal and child health across Ghana. Chris Mulley is a Principal Business Consultant within the Operator Solutions department of ZTE Corporation. He is responsible for the analysis of market and business drivers that feed into the development of cost-effective end-to-end solutions, targeted at major global telecom operators, based on ZTE’s portfolio of fixed-line and wireless infrastructure equipment and ICT platforms. A key part of this role involves informing ZTE Corporation’s strategic approach to the provision of solutions that meet the objectives of the European Commission Digital Agenda for Europe policy initiative for the wide scale adoption of ICT in the provision of e-Health, e-Transport and e-Government across Europe. Chris was instrumental in the establishment of an e-Health collaboration between ZTE Corporation, the Centro Internazionale Radio Medico and Beijing People’s Hospital. Tong En is Deputy General Manager of the Data Service department and Director of the R&D center at China Mobile Communications Corporation (CMCC), JiangSu Company. He has long been engaged in the research of mobile communication and IoT related technologies, and has chaired or participated more than 10 CMCC research projects. He is a multiple winner of CMCC innovation awards, and has published nearly 20 academic papers. Oscar Gómez is Director of eHealth Product Marketing in Telefónica Digital, where he leads the creation and implementation of a Connected Healthcare proposition to help transform Health and Social Care systems in the light of the challenges they are facing. Oscar has global responsibility over Telefonica’s portfolio of products and solutions in the eHealth and mHealth space. Oscar holds an Executive MBA from Instituto de Empresa, a M.Sc. degree in Telecommunication Engineering from Universidad Politécnica de Madrid and a Diploma in Economics from Universidad Autónoma de Madrid. He graduated in Healthcare Management from IESE in 2012. In case you’re interested in the topic but you’re not able to attend the event in person, you can follow the live tweet stream for this panel, by tracking the hashtag #mwc13hlt1. Registration for this “Fiesta or Siesta” event is now open. Knowing many of the panellists personally, I am confident in predicting that sparks will fly in this discussion, and we’ll end up collectively wiser.